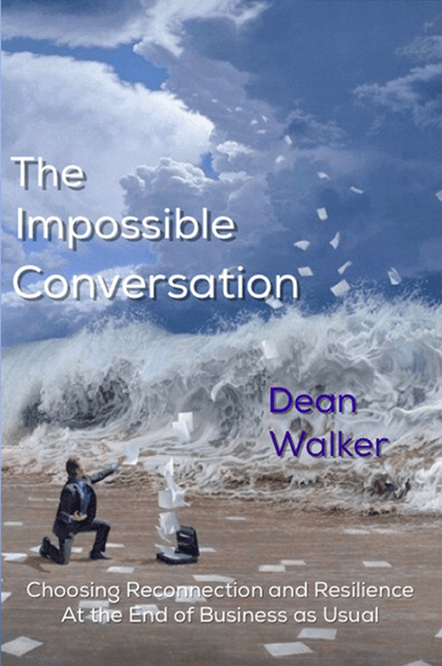 In The Impossible Conversation, Dean Walker recounts his transformational journey from his first contact with the shocking data and projections of Abrupt Climate Change – to the mind blowing awareness of the full scope of the global problems and predicaments we all must face. The Impossible Conversation is not another feel-good guide to our quick return to a thriving economy and business as usual. It is a sober look at how our business as usual paradigm is, in fact, what has driven us to the brink. The Impossible Conversation is deeply committed to keeping it real as we explore together, how to contact the immense power of human beings who are willing to intentionally break open their hearts and profoundly reconnect with their deeper selves, the people around them, and the miraculous web of life on this glorious planet-home, Earth. consider the most challenging aspects of our present and near future. into your heart and allow it to become part of your blood and bones. Craig K. Comstock, Huffington Post. In Walker’s book, what a relief to see the situation defined not as a “problem” that can be “solved,” but as a “predicament” that we must live with. The kinds of “reconnection” described by Walker (reconnection with: deeper self, others, and Earth) would be attractive even if the situation were normal. Given our situation, they are necessary. Walker has some answers, which go less to preventing disaster, than to living with the knowledge of what’s happening. Walker praises reconnection with the deeper self, with other people, and with nature. The (workshop and coaching) project announced by Walker and Carolyn Baker (in The Impossible Conversation) is based on the practice of psychotherapy, a knowledge of history, and experience in organizational consulting. For readers, their books offer some of the very best ideas for the enlargement of a community that can make the “conversation” more possible.